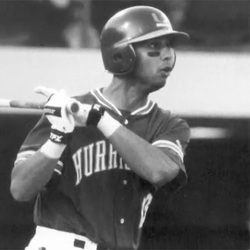 A great defensive shortstop for the 'Canes in the mid-90s, Alex Cora was also clutch at the plate, both in the regular season and in the post-season. Drafted by the Minnesota Twins in the 12th round while in high school, Puerto Rican-native Cora opted to sign with the University of Miami. Cora wasn't content to just be 'clutch' in the field-he always produced at the plate as well, with at least 60 hits each season he was in Miami's lineup. During the three years Cora played shortstop for the 'Canes, Miami was dominant up the middle, with Cora regularly making acrobatic dives, saving runs and winning games. It's no coincidence that all three seasons in which Cora starred on the field and at the plate that UM made it to Omaha. Cora was named to the All-College World Series teams in both 1995 and 1996, and gave everything he had in the 1996 title game against LSU, going 3-5 with a triple and 3 RBIs in a losing effort. With his stellar exploits at Mark Light Stadium, Cora's professional stock rose considerably from his 12th round draft status in 1993. In 1996 the Dodgers selected Cora in the third round, and called him up to the big leagues less than two years later. After seven years in 'Dodger Blue', Cora spent one year with the Cleveland Indians before being traded to the defending world champion Boston Red Sox in 2005. Now starting for the Red Sox at shortstop, he has played in both an NLDS and an ALDS. Cora possesses an impressive lifetime .976 fielding percentage in the major leagues. He and wife Nilda and their two children make their off-season home in Puerto Rico.